Enjoy a day trip to Boston and see all the sights. You will travel by state of the art minibus or coach along the Eastern Coast - through Connecticut to Massachusetts, to it's capital, Boston. NEW YORK – BOSTON – NEW YORK - Depart New York along the East Coast through Connecticut to Massachusetts and its capital Boston. Upon arrival in Boston the tour starts with a walk along the Freedom Trail, then on to the Boston Harbor for a sight of the famous “Tea Party”, the Navy ship the “Constitution” and Bunker Hill, and then it’s off to see the downtown financial district. 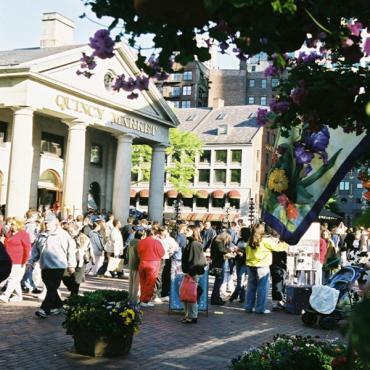 Break for lunch at Quincy Market and enjoy Boston Common. After lunch we cross the Charles River to stroll in the squares of the universities of Cambridge - Harvard and MIT. In the late afternoon we will depart southwest for an evening arrival in New York. TOUR INCLUDES: Air conditioned Van or Bus & Professional Tour Guide, Sightseeing in Boston. Departs New York Sundays and Fridays at 7.00am . Depart southwest for an evening arrival in New York.